Richter customer K.S. of West Virginia boasts of a significant increase in die life using the Richter Titankote C2-SL process when deep drawing bushings and forming surface-critical hub-seal parts. 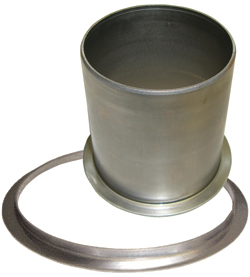 Shown here: a bushing 80-mm dia. by 82 mm tall, and a hub seal 6 mm tall by 80-mm dia. 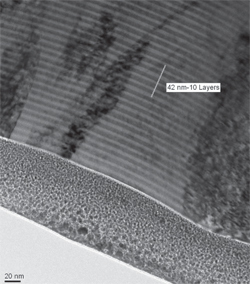 Alternating 4.2-nanometer layers of AlTiN (dark layer) and CrN make up the Richter Titankote C2-SL PVD coating. Wear resistance is optimized since the layers prevent the propagation of micro-fractures, the company says. For hard-working dies where dimensional tolerances also prove particularly challenging, effectively prohibiting the use of high-temperature TD coatings, Richter has developed a new, low-temperature PVD process called Titankote C2-SL (Super Lattice). The process deposits complementary, alternating nano-layers of AlTiN and CrN. The resulting film consists of more than 1000 highly oxidation-resistant layers and a coating hardness in excess of 3500 Vickers. Automotive-industry supplier K.S. of West Virginia Co. (KSWV), Ravens-wood, WV, is a believer in the C2-SL process, having approached Richter early in 2009 for help with a deep-draw dies used to stamp bushings. Says KSWV quality manager Jeff Easter: “The draw dies generate a lot of heat forming the mild-steel (1.8 mm) bushings. The press runs at 18 to 22 strokes/min. and parts exit the die at around 120 F. Our TiCN PVD coatings were failing after 25,000 parts. We tried different coatings, fine-tuned the die radii and adjusted the clearances, and still struggled, finally turning to Richter for the Titankote C2-SL coating. “Since September 2009, the Titankote C2-SL-coated die has run more than 150,000 parts,” Easter continues, “and we’re approaching 200,000 parts. And, in addition to the huge increase in run time, surface finish of the parts also has improved dramatically. Based on that success, we’ve used the coating for many other dies and generally experience triple the life compared to other TiCN coatings, at about one-third the cost. Teikuro, a Japanese hard-coating company established in the United States in 1987 to support NUMMI operations in California, specializes in chrome plating of large OEM automotive dies. In 2000 the firm added a thermo-reactive diffusion (TRD) coating to its resume to round out its offerings to the stamping industry. 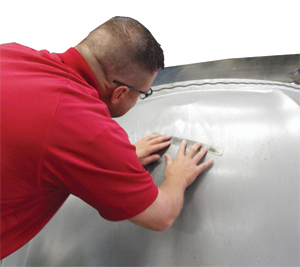 It’s most proud of the expertise its employees have in die prep—grinding and polishing—to optimize the life of its coatings. “It’s the elbow grease and the time we take to hand-work the die steels that optimizes coating performance in the stamping press,” says Mike Hamell, Teikuro vice president of sales and marketing. “We use proprietary techniques and specially engineered finishing tools developed here and in Japan to allow stampers to (often) get hundreds of thousands of hits before requiring the dies to be replated. “Our success is based entirely on the skill level of our employees,” Emerich adds. “The majority of the operators in our die-finishing department have completed seven levels of competency testing over a 7- to 9-yr. period. Each level comprises 800 hr. of documented on-the-job training in grinding, finishing and welding skills. However, before attempting to repair a die surface or weld, it’s essential that the shop determines the exact composition of the base material and of any repair welds that the stamper has made, says Teikuro’s TRD superintendent John Murphy. The Teikuro TRD building houses several coating lines that cool coated die components slowly from 1750 to 1850 F down to room temperature, minimizing shock and distortion. “We can tell the customer exactly how thick the coating will be, every time,” Murphy continues, adding that the firm’s internal standard for optimum coating thickness for metal-stamping tooling generally falls between 7 and 10 microns. Adds Teikuro TRD customer Pat Welsh, owner of small die-repair shop City Tool & Machine, Hartford City, IN: “We’ve recently been using the TRD coating on DC53 tool steel (from International Mold Steel) on draw rings, as an upgrade over D2, and the steel combined with the coating definitely provides a significant upgrade in run time between die maintenance. See also: Richter Precision Inc., Teikuro Corp.